maintenace, controlling, non-destructive testing, gas detection et. al. which provides helpful tips for people involved with radiological detection, identification and monitoring who are looking for expert advice to help them evaluate and purchase the right tool for a deployment program. require different detector sizes and sensitivities. Some applications require smaller, more rugged devices while at other times, increased sensitivity outweighs the importance of deploying a compact, lightweight instrument. It can be a complicated decision, but it doesn’t have to be. 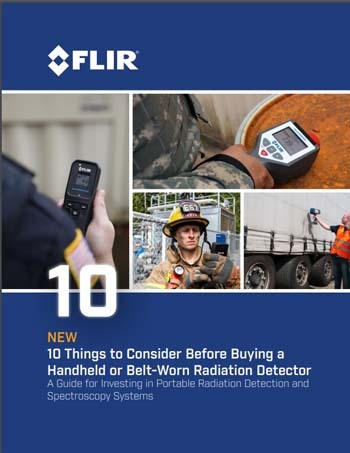 This new guidebook, written by the CBRNE experts at FLIR Systems, provides 10 helpful tips for evaluating and selecting a handheld or belt-worn radiation detector. Recognizing that your radiological detection is just one part of a deployment program the guidebook provides helpful advice regarding cost versus performance trade-offs in different application scenarios. In addition, the guidebook answers questions including What level of sensitivity do I need? How should an instrument behave when pushed to its limit? and How do I plan and budget for long-term support of my deployment program? To request a free copy of this informative new guidebook please visit https://www.flir.com/discover/threat-detection/radiation/radiation-guidebook/ or contact FLIR Systems in Europe on +32-3665-5100 or detection@flir.com.